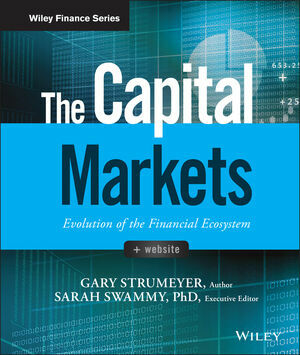 The Capital Markets: evolution of the financial ecosystem is the new standard providing practical text book style coverage of this dynamic market and its products. Written by the former President of BNY Mellon Capital Markets, LLC for both financial professionals and novices, The Capital Markets provides a comprehensive macro view of the marketplace and how its products operate. GARY M. STRUMEYER is the former president of BNY Mellon Capital Markets, LLC. He is the author of Investing in Fixed Income Securities and Keys to Investing in Municipal Bonds. Gary is a former adjunct professor at NYU's School of Professional Studies. SARAH SWAMMY is a managing director, business manager, and head of supervision for BNY Mellon Capital Markets. She is a member of BNY Mellon Capital Markets Board of Managers and serves as a member of New York Institute of Technology School of Management's executive council. Sarah is an adjunct instructor at NYU's School of Professional Studies. David Isaac and Francis C. Reed, Jr.